In light of the upcoming election, I thought I would discuss the grassroot politicizing that has begun to creep into the advertising mainstream. One “movement” in particular caught my eye as both disturbing and creative. 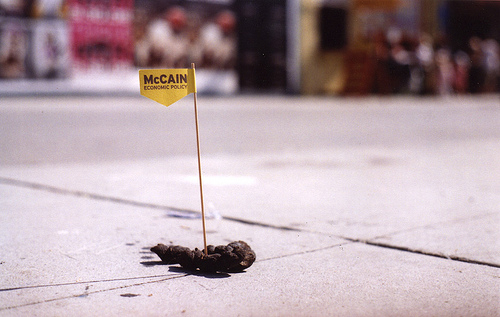 Venice artist, designer and activist Greg Beauchamp decided to take to the streets adorning dog feces with his opinions of John McCain’s proposed policies on the economy, foreign policy and how he feels about McCain’s campaign tactics. I won’t argue with the creative, albeit unconventional, method Beauchamp chose to get his feelings across to the general public. As a matter of fact, I audibly laughed when I first saw the image of a little pile of dog poo with a mini sign in it. After I stopped laughing, I realized his method proves nothing but the fact that there are stinky political extremists on both sides. Beauchamp chose to stoop to a new low in political advertising, and however ingenious the idea may be, I find it to be irresponsible both from an environmental and a political standpoint. From an environmental standpoint he chose to litter the public sidewalks. Some could also argue that his advertising method would encourage others to leave their dog poo behind in hopes that it would be used for future “pooliticizing,” leading to an even larger and potentially stinkier problem. The political standpoint is obvious. Both camps have had their fair share of low jabs, either directly from their camps or from the extremists that have taken to the streets in support of their candidate. This kind of behavior only encourages more of the same from the other camp. As a designer, I always enjoy out-of-the-box creativity, but this may have gone just a little too far outside of the box for me. After my initial reaction, I was a little disgusted.